A possible new Earth-like world has been found, and it’s giant, according to a study [PDF] published today in Nature. LHS 1140b, an exoplanet a mere 40 light-years away, is 40 percent larger than Earth while orbiting a tiny red dwarf star one-fifth the size of our own. That might not seem like the recipe for “Earth” or “life,” but the planet resides in its star's habitable zone, the slim "Goldilocks" orbit at which water can exist as a stable liquid. It also exhibits characteristics of a rocky world, which is significant: where there’s water and rock, there’s a possibility for life. The world was discovered using the transit photometry method of exoplanet detection. As a planet crosses in front of a star, the star dims slightly. Think of an annular solar eclipse: When the Moon crosses in front of the Sun but is too far from the Earth to blot out the Sun entirely, the day is dimmed but isn’t plunged into darkness. The same principle applies here, though on a much finer scale. The amount the star dims also reveals its size. 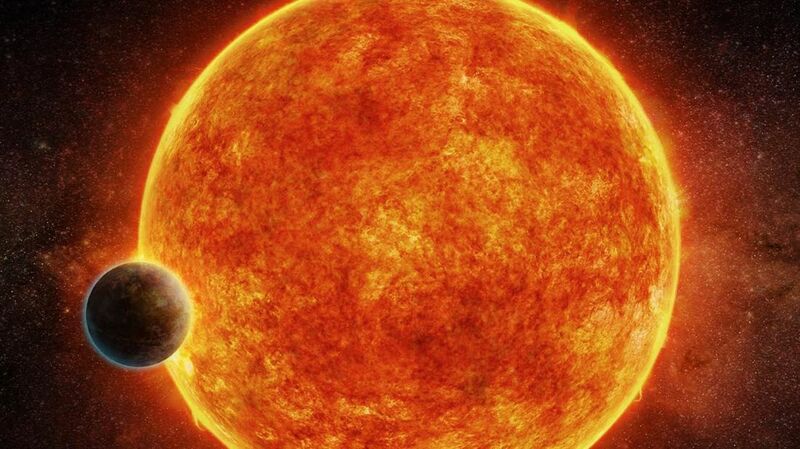 So what makes this exoplanet so special? What about the TRAPPIST-1 worlds we were celebrating last month? That party might have been a bit premature. Scientists have only measured the density of one of those worlds, and turns out: It isn’t rocky. So … maybe none of the others are, either. While they’re certainly Earth-sized and in their star's habitable zone, imagining Earth without rocks is something of a challenge. LHS1140b, though, is rocks for days, and now that scientists know it's there, the plan is to study the hell out of it. Jason Dittmann of the Harvard-Smithsonian Center for Astrophysics and lead author of the study tells mental_floss that the team studying LHS 1140b has been allocated Hubble Space Telescope time to do another transit observation. They’ve also applied for further Hubble time and x-ray telescope time in order to assess the high-energy environment the planet may be experiencing. Here on Earth, they hope also to use both Magellan telescopes at Las Campanas Observatory in Chile, and their Chilean collaborators have applied to use three of that country’s Very Large Telescopes. "So, basically, we're hoping to throw everything we have at this planet!" he says. The James Webb Space Telescope, set to launch next year, will really unlock the mysteries of LHS 1140b. "We hope to be able to detect not just that this planet has an atmosphere but also what it's made of. In particular, [James Webb Space Telescope] may be sensitive to carbon dioxide, water, methane, and ozone," he says. The Giant Magellan Telescope and European Extremely Large Telescope, both under construction, might be able to detect molecular oxygen as well, as the strongest features of that molecule exist at more optical wavelengths. "If we can do all of these things, we might have a pretty clear picture about the atmosphere, and what's in it, and hopefully we can even say that's very similar to the Earth's." Dittmann's Harvard colleague David Charbonneau, a co-author of the study, tells mental_floss that until James Webb launches, there’s much work to do. "First, we need to figure out the ultraviolet emission from the star," he says. "Some red dwarfs have huge amounts of UV light, which can be devastating to the atmosphere, and life! So, we are planning to use the Hubble Space Telescope to learn that. Also, there is one (and only one) good ground-based opportunity to study the planet from Chile this fall, so we are trying to have every large telescope in Chile point at the system on that night. We are calling it Transit Night." That will take place on October 26, 2017. While ground-based observations won't be as penetrating as what the James Webb Space Telescope will be able to do, they will tell scientists if the atmosphere has, for example, lots of hydrogen and helium ("which would make the atmosphere fluffy and easy to detect," he says) and thus not Earth-like. Once the telescopes in development go online, however, there is even a chance that they can find signs of life. "[The Giant Magellan Telescope] can detect oxygen, which is an atmospheric biosignature gas," he says, though oxygen alone isn't enough. "Maybe, unlike Earth, the oxygen is made by a different process, such as UV light breaking apart water in the atmosphere. The [James Webb Space Telescope] observations will be sensitive to the other molecules—methane, water, carbon dioxide—that would allow us to know whether the oxygen really is produced by life." LHS 1140b was first detected by Harvard’s MEarth (pronounced "mirth") project, and confirmed by the European Southern Observatory’s High Accuracy Radial velocity Planet Searcher. The planet is thought to be at least five billion years old, and its size and density suggest a dense iron core beneath its rocky surface.